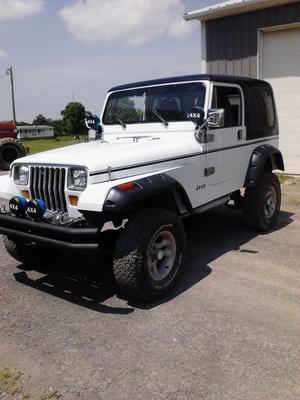 We found this lonesome '88 YJ in Pennsylvania sitting around waiting for some one to take her home and give her some love and affection, so that is what we did. 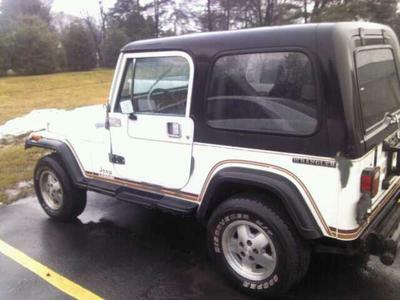 It was a stock Laredo when we got her and now she has a new 5.0L V8, with a AX-15 5spd. transmission, NP-231 transfer case, 4-inch lift, new paint, rino lined interior, 33/12.50/15 tires, 2sets of off road lights, and two happy owners. Larry's Comment: Ross and Melissa...I like what you have done with the V8 transplant, AX-15 (instead of the original Peugeot, or AX-5 5spd. ), and the whole set-up. 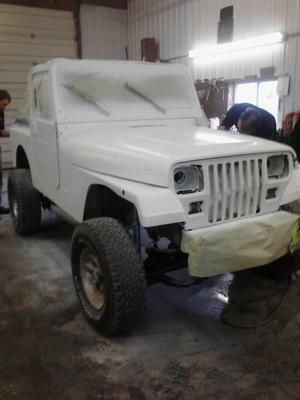 Most of all I think the paint job looks really sharp from the photos...plus I am partial to white Jeeps (my YJ is red, but my Comanche is white). 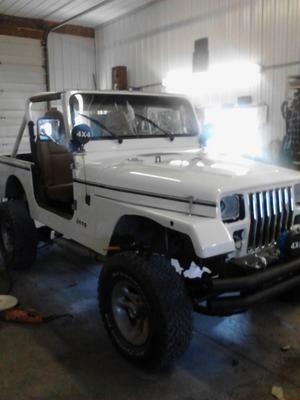 Have fun with that super looking YJ.